For the past two years, my daughter and I have volunteered for the End Hunger 3.6 event sponsored by the Madison Rotary at Drew University. This year the event will take place on Saturday, March 9, 2019. While the morning shift is full, there are still spaces in the afternoon shift, from 12pm-2pm. Visit www.madisonrotarynj.org to learn more, see a great video about the event, and sign up. It's an amazing community service event, and really shows how much of an impact we can make by working together. This past Saturday was the busiest day possible for our family. Between softball and baseball practices, Girl Scout cookie booth sales, a birthday party, and the library gala, we barely had time to breathe, and definitely didn't have a single meal together. Despite the hectic day, I felt that it was important to squeeze in one more activity--joining the Madison Rotary Club in their End Hunger 3.6 project to help package up nonperishable meals to be distributed to local organizations serving those in need. The 3.6 in the title indicates that every 3.6 seconds, someone dies from malnutrition or starvation. Tables ready, tutorial given, and excited to start making meals! When my daughter (age 8) and I arrived, the Drew University fieldhouse was filled with about 20 tables, already set up with large boxes filled with loose pasta, beans and soy, funnels, scales, bags, and empty packing boxes. We were given a brief tutorial about how to put together the food packages (our table made tomato basil pasta packs): place a flavor packet in the plastic bag, place the bag over the funnel end, pour in one scoop of dried soy, one and a bit scoops of dried pasta, remove the bag from the funnel, weigh the bag (removing or adding pasta until it is exactly 340 grams), squeeze out the excess air, heat seal the bag, pile up 36 bags, and box them up. Measuring, weighing, sealing, and boxing up the meals. We were placed at the "Girl Scout" table, with a few girls and leaders from my third grade troop, and several from an eighth grade troop working toward their Silver Award. There were tables around us filled with Drew students, YMCA staffers, churches, and other groups. Young and old worked side by side to get the packs made. 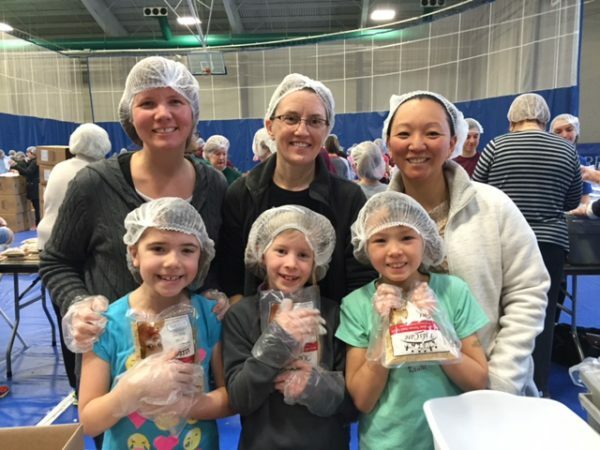 According to the Rotary Club's Web site, 500 volunteers from 25 groups packed 123,000 meals in all during the two shifts that day from 9am-3pm. Mayor Bob Conley was there, too, helping to load up the vans with filled boxes. It was a beautiful community event. Mayor Conely helping to box up and load the meals. When the rest of our Girl Scout tablemates arrived, we each took a job--filling, weighing, sealing or packing the box--and we rotated jobs when people wanted a change. I loved watching how seriously our eight-year-old Brownies took their jobs, especially being so careful about making sure each pack weighed exactly 340 grams. Though I didn't count the exact number, I estimate that our little assembly line filled about 300 bags of food in our 2 hour shift. While we were there, FiOS1 News came by our table and asked us a few questions. My daughter's response about why she enjoyed the day helped me know that adding this activity to our packed schedule was worth it: "It makes me fell like I can actually do something to help people rather than just watch." This blog first appeared on March 31, 2017. The End Hunger event for 2019 will occur on Saturday, March 9. Check www.madisonrotarynj.org to learn more. Afternoon volunteer shifts still available.